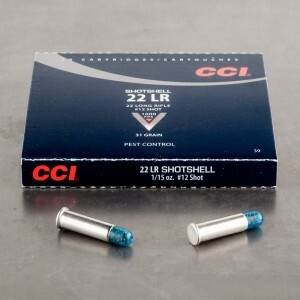 Shotshells for the .22 Long Rifle are comprised of a hollow plastic shell containing small lead shot. When fired, the lead pellets are propelled out the barrel and spread out, much like a traditional shotgun shell. This spread makes .22LR shotshells useful for hitting small, moving targets. 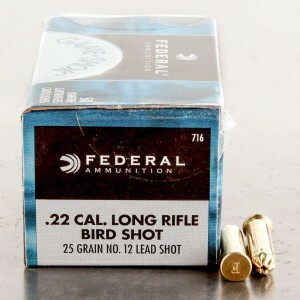 Due to the design differences between rifled .22LR barrels and smooth shotgun bores, .22LR will spread quickly, so shooters should keep ranges fairly close. 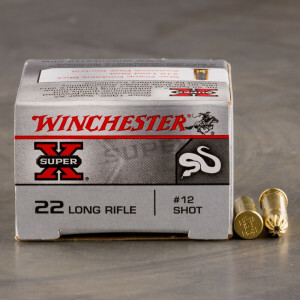 .22LR shotshells are the clear choice for exterminating small pests, such as mice, rats or snakes, where larger calibers or other bullet types would be too destructive to the surroundings. Good price and fast delivery. Shoots fine and will purchase more. Excellent cartridge for snakes, rats and mice. There is absolutely NO substitute for this stuff! I had a rattlesnake crawl into my barn-garage onto the concrete floor and curl up for a nap. My truck was parked only 3 feet away. Using this stuff in my trusty Ruger Single Six I was able to easily obliterate the critter's head with one shot at about 30 inches. There was absolutely NO splatter or collateral damage of any kind. Although I was of course wearing safety glasses, I did NOT feel a single grain of shot hit my skin even though I was wearing a short sleeve shirt.